I like this simple image, to me a trompe l’oeil, or trick on the eye, although literally the phrase refers to things like those doorways to imaginary gardens painted on walls. Ah, ‘the other’... The French do seem to always return to that theme.For these two iron frame chairs, ‘the other’ certainly lurks just behind them changing their sense and indeed ‘presence’. The French Humanist photographers claim to document their surroundings through an unbiased and non-critical lens. A guide for one exhibiton explains that she is praised for making ‘full of light, making play with shadows and blurred areas’ and, above all, for her ‘reconciliation with reality’. I suppose a photographer should do that. 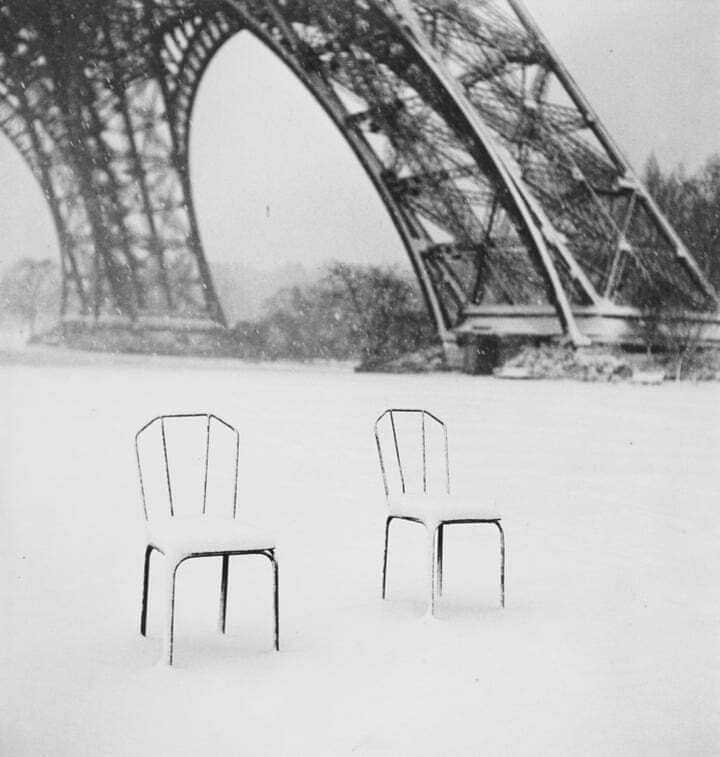 The congruence I see between the pairing of chairs and the Eiffel Tower is of aesthetic minimalism: The chairs are shown as bare, minimalist metal frames, and, in its own supremely iconic way, the Eiffel Tower is likewise shown as a bare, minimalist metal frame. The lines of the chairs are thin (seemingly weightless); the lines of the tower are, starkly differently, of course thick (exhibiting great heft). Although the latter contrast is where congruence ends, the juxtaposition of chairs and tower still seems to work aesthetically — if not functionally. In both cases, the frame is enough to achieve the aesthetic point possibly intended by the image’s photographer. In both cases, the gaps between the lined frames don’t need to be filled by the artist, to complete the form; that’s left to the mind’s eye of the observer — if, even, at all. Rather, observers may well be contented settling on what one might call the ‘sufficiency of minimalist form’. Perhaps, therefore, ‘playing with forms’ might be as germane of a title here as ‘playing with shadows’. What I got most from the image was the sense of movement, Keith. The out-thrown legs of the chairs mimic that of the tower behind. In this way the image created for me a new perspective on the tower, that of a 'crouching monster'! An 'unbiased and non-critical lens' surely does not exist. One might be tempted to think so, since the photographer might appear at first to be a mere witness to what is there -- but to borrow some words of Charles Beard, a historian, photographs do not select themselves, or force themselves into any fixed scheme of arrangement in the mind of the photographer. Hence photography may be dangerously deceptive. The other..... to me seems the other chair.